I wrote back in August 2016 out of frustration. There were any number of topics to have become flustered over at the time, but on this particular occasion it was the personal savings rate. Because it is, like productivity, essentially a plug in between two statistics whenever those two particular series, income and spending, are subjected to revision it can practically rewrite the savings rate.  The data series contained within the suite are subject to not just major benchmark revisions but significant revisions within just the high frequency time frames. Perhaps the most pertinent example of this is the personal savings rate which has been revised all over the place such that there cannot be any confidence whatsoever in the statistic. 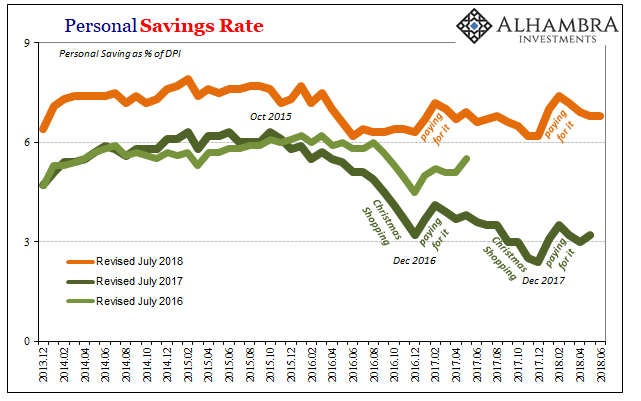 Last week in tandem with benchmark GDP revisions, the Bureau of Economic Analysis (BEA) forewarned us of another wholesale recomputing of the savings rate. Based on new data made available by the IRS’ National Research Program, the BEA has raised its income estimates to “correct for the effects of taxpayer underreporting.” How the IRS has decided taxpayers are “underreporting” isn’t clear (audits? 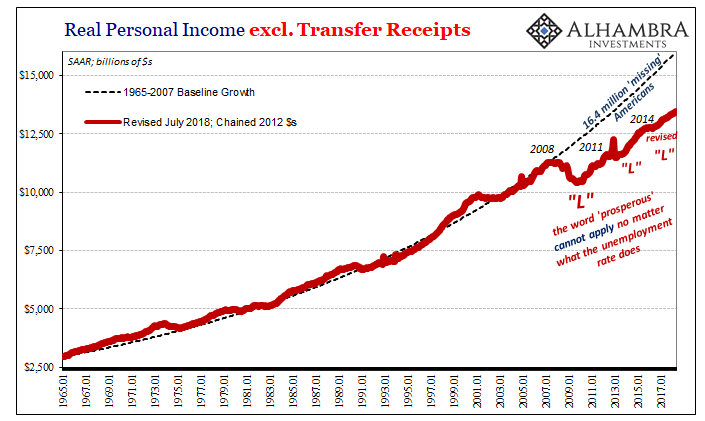 ), regardless there is more income than previously believed and reported in the national accounts. That means we have to try to account for two recent transformations. The first is this planned switch in all the “real” series from a 2009 reference point to the 2012 fixture that will be used in the years to come. As noted last week with GDP benchmarks, the deflationary 2012 dollar makes the economy look better if only by altering the angle of the prism through which it is being filtered. It’s the same “L” riddled economy only with higher numbers attached throughout. It’s pretty easy to correct for and to harmonize the seemingly disparate benchmarks. 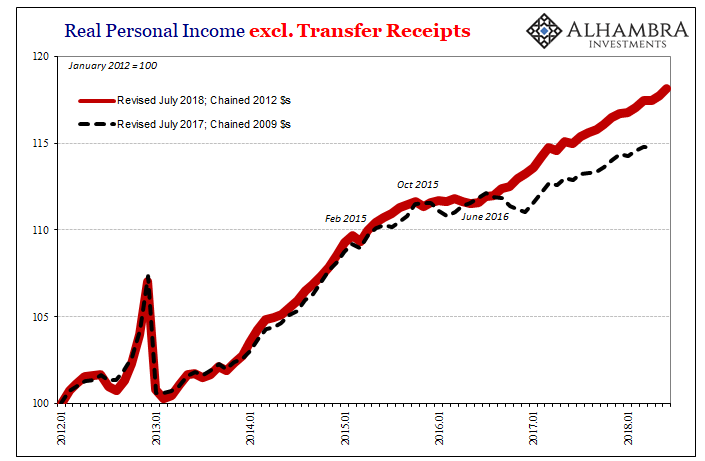 When doing so, we find that the “underreporting” of income meant slightly less income, somehow, in the middle 2000’s and even during the worst of the Great “Recession”, but substantially more income over the past few years. Starting around the middle of 2016, coincident to the turn toward reflation in things like oil prices, personal incomes in the aggregate moved upward though still on a reduced, historically low trajectory. In other words, less bad. 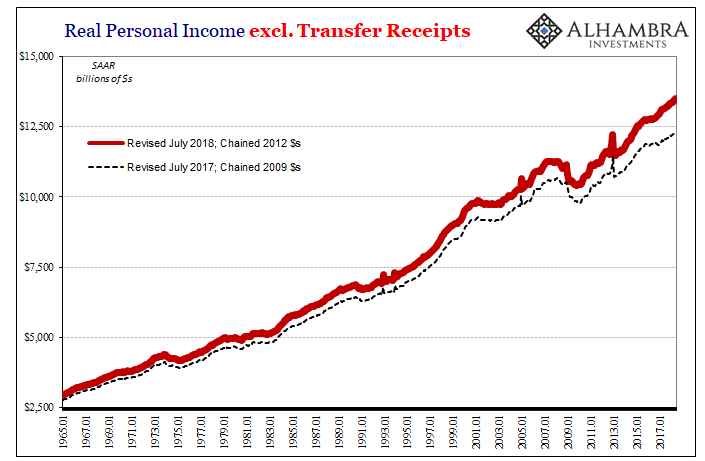 The primary culprit of “underreported” income was proprietors’ income along with contributions from dividends/interest. Small business owners, it appears, have been faring better since the more sharply defined 2015-16 downturn even if, apparently, they’ve been reluctant to share that information with tax authorities. As you can see above, it’s not just limited to Reflation #3; indeed, according to these new benchmark numbers, it’s been a chronic issue for the entire “recovery” period, only sharpened in the very near past. Business owners cheating on their taxes because they can’t afford to pay the full amount? That would actually make sense for once. Though the BEA’s technical note doesn’t offer much detail, the shape of the new benchmark series looks awfully familiar. 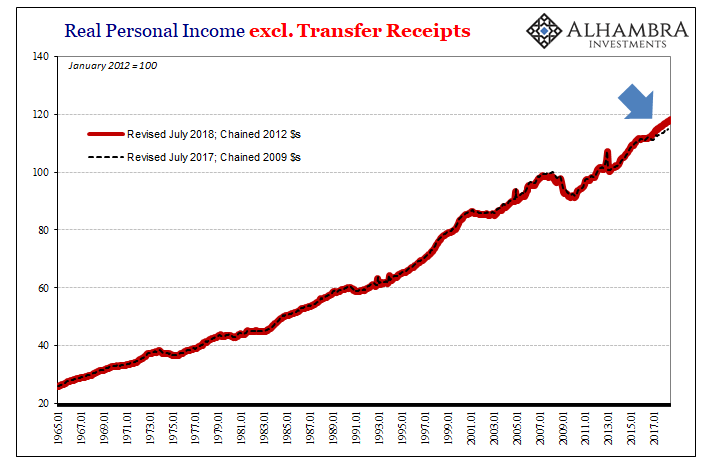 It’s as if the income reporting problem has been limited to gasoline station owners or oil patch master LP’s. Again, it looks a lot like the price of crude oil. In any case, because the adjustments are in proprietors’ income along with dividends and interest these are not labor market payments. For some reason, and we have a good idea what that really is, small business owners are doing better but they aren’t sharing those gains with workers, either hiring new ones at a faster clip or paying those already employed commensurate with the (idea of a) LABOR SHORTAGE!!!! Income growth remains suspiciously muted despite the sharp fall in the unemployment rate. The downward bend in the trajectory for income is less downward because of “underreported” ownership income but the troubles in the labor market remain. In fact, it’s all the more suspicious given how small businesses could be making substantially more money and then not putting it to work as they might in an actual boom period. Personal spending was not revised by more than trivial amounts here or there. Fortunately for the economy, the Obama era requirement (under Obamacare) for all businesses including proprietors to document their spending (over $600) to the IRS via 1099’s was repealed in 2011. Thus, we can’t know if Americans have been underspending, as well. 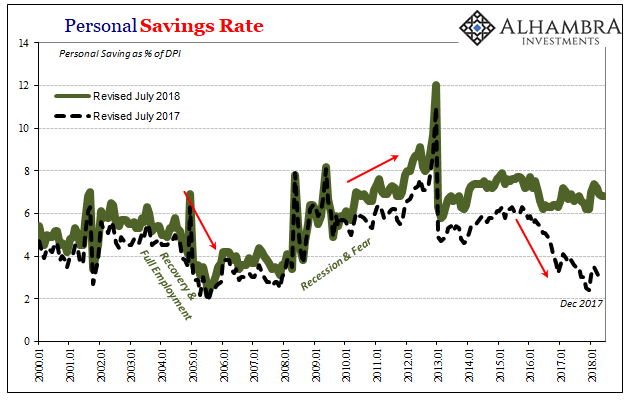 What that means in terms of the personal savings rate is that it is now almost unrecognizable in the context of its prior benchmarks. 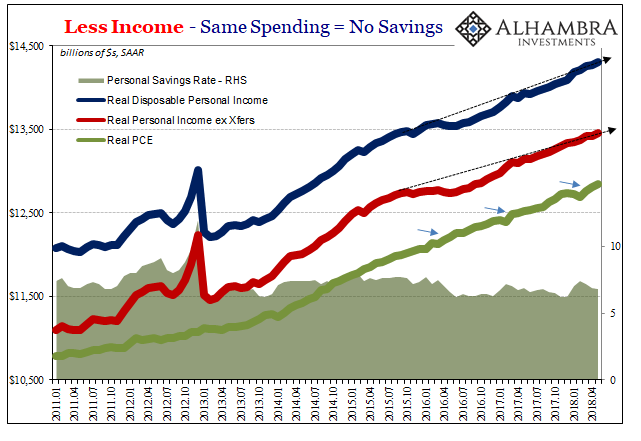 With more income figured in the aggregate pool without an increase in spending, the savings rate by equality has to have been significantly higher. We still find, however, the same “residual seasonality” pattern embedded within it even at its loftier, more sensible perch. 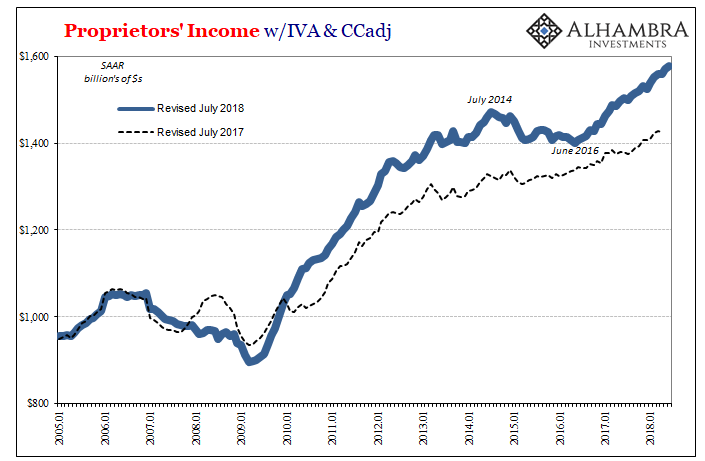 Again, that’s due to the fact that labor income remains on the reduced, troubling trajectory even if proprietors have been somewhat better enjoying Reflation #3. Instead, we are left wondering just how damaged the overall economy has been under this “rising dollar” period, a task made incredibly difficult from this perspective by not just the constant reshaping of trends and patterns via significant revisions but also the inclusions of large and unnecessary (in my view) imputations and phantom economic accounts in the first place. In other words, there is a good chance that “something” happened at the start of 2016 that may explain the rest of this year in some part; it is just impossible to tell from these ever-changing numbers (and the way they are put together in the first place) what it was and by how much. 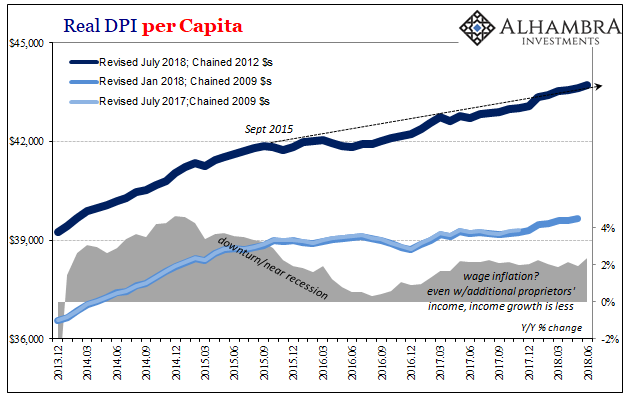 It is now almost August 2018, and we still don’t know the extent of the damage that was done by the near recession. That particular downturn is better defined as we go further in time (doing us no favors in realtime, allowing Economists and policymakers to say “strong” economy over and over, and then skip over the past without ever having to go back and correct their record with more accurate estimates), but, ironically, that makes it more difficult for the period following it. Small businesses have been making more money, OK, but why aren’t they doing anything with it? Makes one wonder. Data, especially more accurate data, is supposed to clarify.